I never read non-fiction book, and even less biographies and the like. But I was browsing Audible because I had no idea what to buy with my credit of the month and found this and I noticed that it was read by Lauren Graham so I thought it was perfect. It was not difficult to convince me then. I am not really into movies and series and actors and things like that. I’m really bad at remembering famous actor names for example. But I’ve always loved Lauren Graham. I think she is fascinating, she always has really interesting roles and she is hilarious. I’m even thinking about doing a Lauren Graham movie/series list. Anyway, that is why I decided to get this audiobook. And I’m glad I did because it was amazing. She makes you think about the world you live in, but in such a subtle way. She makes you want to change a lot of things in your life but she is not even telling you to do it, that’s how good she is. Plus, she is hilarious. I was laughing so hard sometimes it was a bit dangerous (I’m listening to audiobook in my car, almost could not see the road because I was in tears). With this book she has just proven that she is so much more than just a good actress. I loved the part where she talks about the set of Gilmore Girls and all the anecdotes about filming this series. You also discovered how she became the famous actress she is today. I’m so glad I learned more about this beautiful person because I really do think she is extraordinary. I’m definitely going to read her novel (Someday, someday, maybe) and probably all of the books she will ever write. 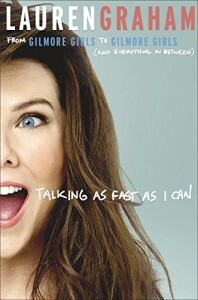 If you want to know more about the filming of Gilmore Girls (and/or Parenthood) and at the same time discovering her thoughts about simple things, just read it. I also totally recommend to listen to the audiobook because it was really well done (the problem is that you do not see the pictures she is referring too).